Liquid or solid samples are manually introduced into the DMA-1 autoinjector or the DMA-80 sample boats. Prior to combustion, the sample is initially dried in an oxygen stream passing through a quartz tube located inside a controlled heating coil. The combustion gases are further decomposed on a catalytic column at 750 °C. Mercury vapour is collected on a gold amalgamation trap and subsequently desorbed for quantitation. 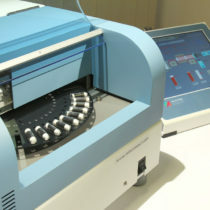 Mercury content is determined using atomic absorption spectrometry at 254 nm, and the results are displayed using an integral Pentium-based control terminal or with PC software. The large touch-screen interface provides easy, graphical interaction and allows manual operation of the instrument, as well as pre-programmed, unattended automatic operation. Parameters can be changed in the middle of a sample run and there is no need to wait for an entire queue of samples to be processed. 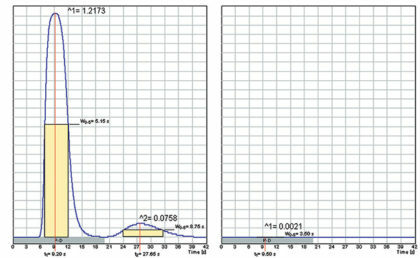 A typical peak profile resulting from analysis is shown for a dual cell system where the 1st peak corresponds to the long pathlength flow cell and Hg content up to 20 ng. 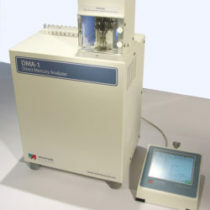 The instrument determines the absolute amount of Hg (normally expressed in ng), and then the software calculates its concentration in the sample. The 2nd peak corresponds to the short pathlength flow cell and Hg content in the range of 20-1000 ng..The software measures the height, the half width and the area of the absorbance peak, that assists in both method development and troubleshooting. Secure electronic data keeping made easy with Milestone’s software that fully complies with CFR 21 part 11. 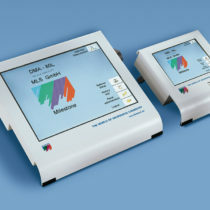 Included with the DMA analyser is a unique web based application – Milestone Connect. The app provides up to date information and extended instrument monitoring from outside the laboratory of analysis, elapsed time and, finally, results. 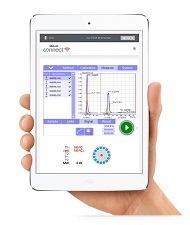 Moreover, users can check saved methods, instrument calibration and settings. The app works on various external devices such as PC, tablets or smartphones. The integral database includes specific and detailed information on the installed equipment (list of parts, technical notes, user manual, video tutorials, etc), continuously updated application notes, a library of available scientific articles published in scientific magazines, and a help-on-line section that provides instant support available 24 hours a day, 7 days a week.